I can tell you with certainty that a combination of tactics, techniques, and procedures inclusive of threat modeling and analysis, good data science (read The Field Guide to Data Science), and risk management with the likes of SimpleRisk, will lead to an improved security posture. I’ll walk you through a recreation of various real world scenarios and current events using SimpleRisk after some quick installation pointers. 19) Change the admin password! As seen in Figure 1, Fred can be very specific in his risk documentation. 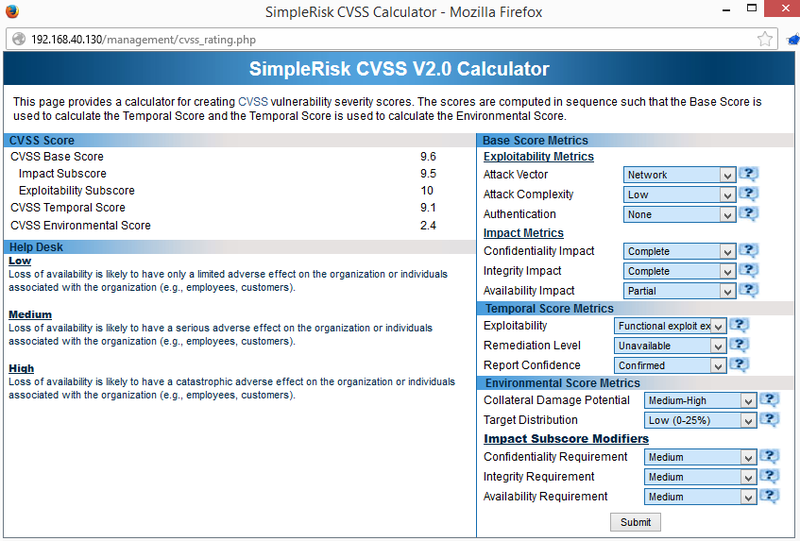 As Fred works on the watering hole risk, he decides he’d rather use CVSS risk scoring than classic and is overjoyed to discover that SimpleRisk includes a CVSS calculator as seen in Figure 2. There is also an OWASP calculator the Fred uses when populating the XSS risk and a DREAD calculator he uses for the POS risk. When Fred and Wilma move to the Plan Your Mitigations phase they are a bit taken aback to find that SimpleRisk has stack ranked the XSS risk as the highest, as seen in Figure 3, but they recognize that risk calculations can be somewhat subjective and that each scoring calculator (CVSS, DREAD, OWASP) derives scores differently. 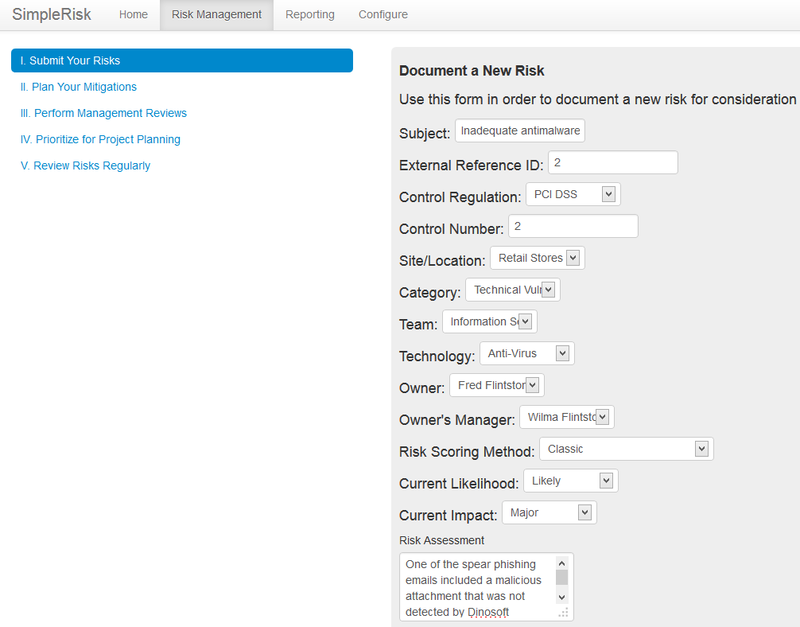 SimpleRisk does include links to references for how each is calculated. Fred and Wilma believe that the XSS vulnerability happens to be one they can have mitigated rather quickly and at a low cost, so they choose to focus there first. 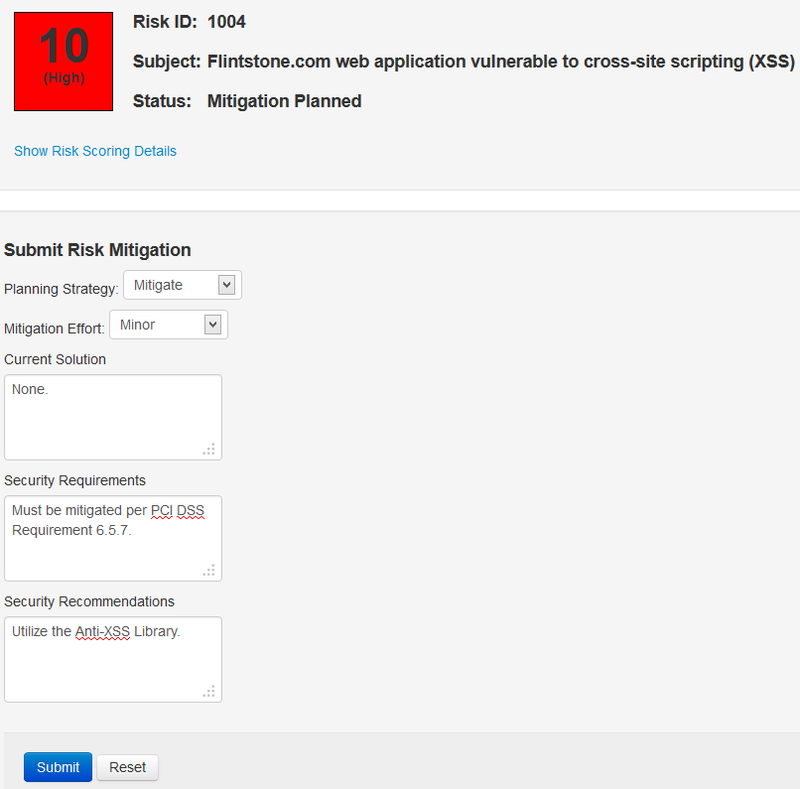 Clicking No under Mitigation Planned for ID 1004 leads them to the Submit Risk Mitigation page. They submit their planned mitigation as seen in Figure 4. After SimpleRisk accepts the mitigation Fred and Wilma are sent promptly to the Perform Management Reviews phase where they choose to review ID 1001 Account Compromised via social engineering by clicking No in the related row under the Management Review column. Under Submit Management Review they choose to Approve Risk (versus reject), Consider for Project as the Next Step and add Deploy two factor authentication under Comments. Under Prioritize for Project Planning, Fred and Wilma then add a new project called Two Factor Authentication Deployment. They can add other projects and prioritize them later. They also set a schedule to review risks regularly after planning mitigations for, and a conducting reviews of, their remaining risks. As the CISO and CEO of Flintstone, Inc., Fred and Wilma love their executive dashboards. 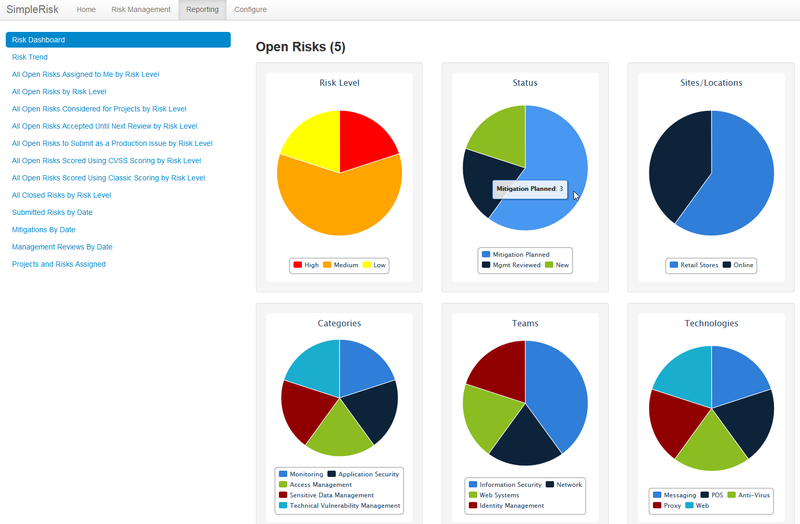 They check the SimpleRisk Risk Dashboard under Reporting, as seen in Figure 5. 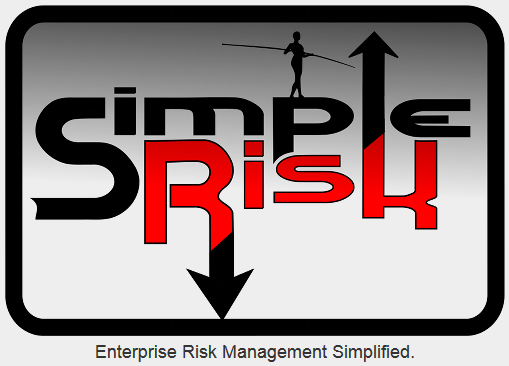 They also really appreciate that SimpleRisk maintains an audit trail for all changes and updates made. · Custom Authentication Extra: Currently provides support for Active Directory Authentication and Duo Security multi-factor authentication, but will have other custom authentication types in the future. · Team Based Separation Extra: Restriction of risk viewing to team members the risk is categorized as. · Notification Extra: Email notifications when risks are updated or due for action. · Encrypted Database Extra: Encryption of sensitive text fields in the database. Josh has devised a great platform in SimpleRisk; I’m really glad to have caught mention of it rolling by in Twitter reads. It fits really nicely in any threat/risk management program. On a related note, as I write this Adam Shostack’s new book, ThreatModeling: Designing for Security is nearing its publication date (17 FEB 2014, Wiley). Be sure to grab a copy and incorporate its guidance into your risk, threat and vulnerability management practice along with the use of SimpleRisk.